I am SO happy it’s October, I don’t actually know where September went if I’m honest? I feel like because it was so busy it literally passed me in a second. One thing I always switch up, most seasons, is my beauty routine. During the summer (this summer anyway) I was constantly reaching for heavy SPF, toning sprays, anything that would stop my skin burning and to help cool it down. My Autumn skin isn’t the prettiest at the beginning of the season, going from hot to cold breaks my skin out so badly but also dries it out so it’s a bit of a double whammy. I try and hydrate my skin without making it oily or clogging it up so I am going to show you my favourite products some are old favourites and some are recently discovered. The first thing that starts to suffer is my lips. I have honestly tried sooooooo many lip products that heal dry lips. Masks, scrubs, balms you name it I’ve probably tried it. 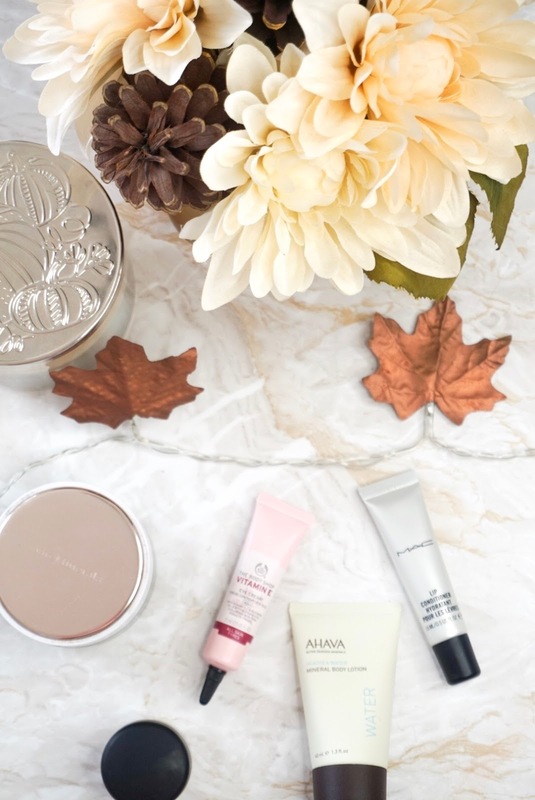 A couple of my favourites includes the Hello Jo lip mask which I love and the Nuxe Lip balms are some of my favourite lip balms for sureeee. However, I was dog-sitting for my mum and her little french bulldog lovingly chewed the plastic one it wasn’t badly damaged because I was pretty quick but he did get all slobber over it and I was a bit like ugh. Anyway I was going to buy another from Nuxe and it was out of stock on the website so I was looking for lip balms, got distracted by Jamie Genevieves MAC lipstick collab and had to buy it and a couple of other bits and then I thought ooh I might as well buy some lip balm and scrub? I haven’t ever purchased any lip care from MAC before so I was a little skeptical obvs but this is honestly up there with my faves, it feels like an actual treatment. The lip scrub is hands down the nices lip scrub I have ever tried, It’s nowhere near as harsh as some lip scrubs but it has the perfect ratio of product/beads if that makes sense? like it’s not full of product with a hint of exfoliation it kind of goes gritty as you combine the product so it hydrates and exfoliates and my lips feel insane and then I apply the lip conditioner over the top and leave it overnight or I do it in the morning and it lasts a decent amount of time too and even once it’s worn off my lips are still super smooth which is a bonus because usually as soon as the product has come off then my lips are instantly dry again. Not the case with this, I love love looove these two products! A product that is a quick fix and solution to breakouts is the BareMinerals face mask. This is a must-have in my opinion. I went through sooooo many face masks that you can only use once and I find it is literally throwing money away so I invested in a tub of face mask which I can use weekly for a long time instead of packets. This BareMinerals mask feels so smooth when it’s on, it doesn’t go hard like concrete it feels like a professional spa type of face mask which I really enjoy. It makes me feel like I’m having a really good pamper at home and it fixes my breakouts and smoothes my skin and I always reach for this every week or so. If I have a random break out I just pop a tiny bit on to the blemish which helps clear it up. I got this little tube of AHAVA Deadsea Water Mineral Body Lotion in a recent beauty box and quickly become obsessed and I have now ordered the bigger size. It is SO moisturising which is something I really need as it begins to get colder outside. This leaves my skin feeling super soft and nourished and does irritate my sensitive skin either. These are the products I start to panic if I run out of them, there is no question whether I need to repurchase or not, I simply have to repurchase. Don’t forget you can follow me on any social media platforms by clicking on the follow icons.